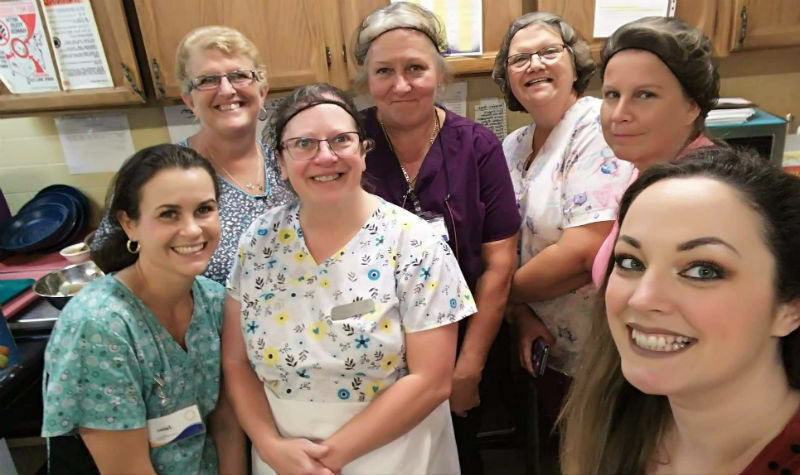 Pictured above, the Village Green nutritional care team. Village Green residents and their families were invited to sample items from the Greater Napanee long-term care home’s latest menu March 19, and the main courses, salads and desserts were well-received, says nutritional care manager (NCM) Miranda Ray. During Taste Test Tuesday, which was included in the home’s Nutrition and Hydration Awareness Week activities, residents and families sampled dishes including Dijon pork chops, marinated steak, cornflake chicken, Greek salad, three-bean salad, macaroni salad and several varieties of cheesecake – a favourite dessert among residents. “We had a dulce de leche cheesecake, a chocolate-swirl cheesecake and a raspberry-yogurt cheesecake, and I think our fancy cheesecakes were the biggest sellers with residents,” Miranda says, adding all menu items featured were enjoyed. The foods served were from the home’s new menu which was launched in February. “Once we go through the first rotation of the new menu, we like to do a taste-test for the families to come in and try the food, and the staff members also get a chance to sample what residents are eating,” Miranda says. There was also a survey for people to take to see if there is anything that can be improved on. The revised Canada’s Food Guide was released Jan. 22. This is the first time it has been updated since 2007. While previous food guides have focused on four food groups – meat and fish, fruits and vegetables, breads and cereals, and dairy – the newest version focuses on three groups: proteins, vegetables and fruits, and whole grains. The updated guide also recommends Canadians substitute animal products more often in favour of plant-based proteins, such as legumes, nuts and beans. Miranda notes Village Green’s new menu incorporates the changes made to the food guide.